The poetry of Connie Wanek will be celebrated on Saturday when a nature trail in Duluth's Hartley Field park is named for her in a public event. The wildflower trail will feature posted excerpts from seven of Wanek's poems--"some of the best poetry written anywhere," Duluth Poet Laureate Ellie Schoenfeld said on Friday. Wanek's first collection, "Bonfire," won the New Rivers Press 1997 New Voices Award. Subsequent books have been published by Holy Cow! Press ("Hartley Field"), Copper Canyon Press ("On Speaking Terms"), and the University of Nebraska Press ("Rival Gardens"). Both "Bonfire" and "On Speaking Terms," were named finalists for a Minnesota Book Award. Wanek has also published a collection of short fiction ("Summer Cars") and served as co-editor (with Joyce Sutphen and Thom Tammaro) on the award-winning anthology "To Sing Along the Way: Minnesota Women Poets from Pre-Territorial Days to the Present." In 2006, U.S. Poet Laureate Ted Kooser named her a Witter Bynner Fellow of the Library of Congress.In 2009, Wanek was named the George Morrison Artist of the Year. She and Kooser are collaborating on a book of poetry for young people, to be published by Candlewick Press. 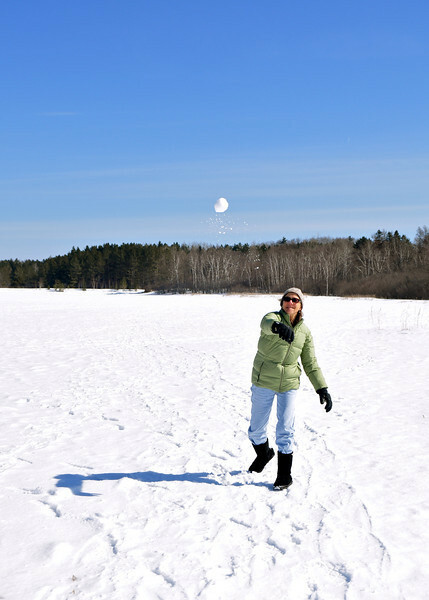 Connie Wanek on a frozen Hartley Field pond. Saturday's event will run from 2-4 p.m. Refreshments will be provided, and Wanek will read her poem, "Wild Asters." The event is free and open to all; the park is at 3001 Woodland Av., Duluth. "All this is due to the generosity and imagination of the current Duluth Poet Laureate, Ellie Schoenfeld, and to former Duluth Poet Laureate, Deb Cooper," Wanek said Friday. "I would never have envisioned any honor like this, and yet nothing could mean more to me." Schoenfeld said, "Aside from the brilliance of her writing, Connie also exemplifies what it is to be a part of a community of writers, to enact a generosity of spirit. She has done so much in her quiet way to bring poetry to people's attention, to support the arts, and to be supportive of other writers. It has been really beautiful to work with a group to honor her in this way in a place that is so meaningful to her and to imagine all of the people who will be strolling on the trail and stopping to read her poems along the way." Here is Wanek's poem "Hartley Field." Reprinted with permission of the author and the publisher. And only for one place . . .
thwarted by so little elevation. I was a challenge, an Everest . . .
with vestigial gills . . .
we’d given up the sky to them, but I understand so little. we have the same blood type, the same myopia. born of both as every child is. and lay themselves at our feet. rise in the hayfield and the lilacs go wild. But then where would we live? the positive hour, shining like mica. then took it up again, every last minute.